Law enforcement question some trolley riders at the Iris Street station as part of Stonegarden Southern Trolley Operation on Saturday. Photo from County News Center. 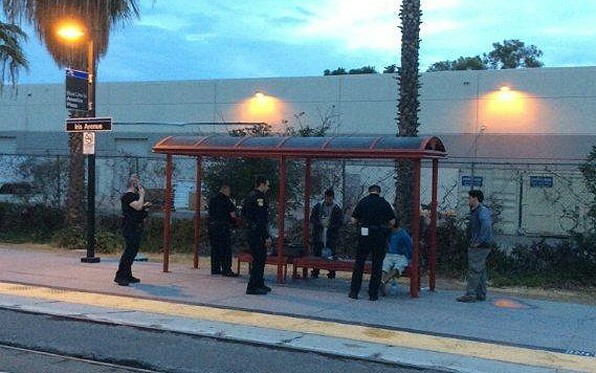 Authorities from multiple law enforcement agencies arrested 29 people Saturday during an operation focused on the Iris Avenue Trolley Station near San Ysidro. County News Center estimates about 60 officers from San Diego County Probation, the San Diego Sheriff’s Department, San Diego Police, Chula Vista Police, Metropolitan Transit System and U.S. Border Patrol were waiting at the station, checking to make sure passengers had valid fare. Riders who did not have tickets received citations, and officers checked to make sure they didn’t have outstanding warrants or parole violations. San Diego County Probation Chief Mack Jenkins said the goal of the Stonegarden Southern Trolley Operation was to enhance public safety in the border region by enforcing laws around those areas of San Diego County. The arrests included those for outstanding felony and misdemeanor warrants, probation violations, and possession of controlled substances. Officers contacted 2,484 people during the operation, and cited 213 people for transit violations. Officers also patrolled the area around the station for anyone who was violating other laws.